I was setting up Lynnette's new Kindle (we are now a two-Kindle family) and in doing so looked at the one newspaper I subscribe to on what is now our old Kindle. I get the "New York Times" breaking news, updated three or four times a day. I scanned through the article list quickly, then I stopped and read one article carefully. 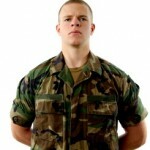 Army has had to change its recruit physical training program. They aren't having the newbies do situps anymore; now they do yoga and Pilates. The underly rationale is partially to cut down on injuries and get soldiers ready for challenging terrain, actually it's because so many more of the youngsters who enter the service are overweight and out of shape. I guess with all I've studied and read on the area that shouldn't have been surprising, but it still was. 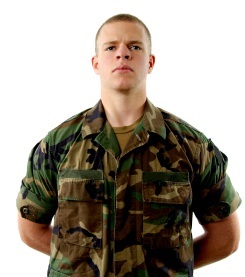 An Army report, "Too Fat to Fight" said the proportion of possible new recruits who couldn't pass the application physical went up by 70% between 1995 and 2008. Many of those who passed that exam still can't "cut the mustard" in physical activity like their predecessors. All this is being attributed to junk food, video games replacing outdoors sports and less time spent in physical education classes in schools. Kids are drinking sugar-filled sodas and more sports drinks and not getting enough calcium and iron according to the three-star general who is in charge of Army recruit training. That plus the lack of serious exercise in their teens leads to a markedly increased percentage failing fitness testing and suffering injuries along the way. I remember when one of my Air Force dieticians came up with a heart-healthy recruit diet trial; that was about 1995 or 1996. The youngsters actually liked the fruit "pizza" and other food items she substituted for what one senior officer on our base termed "the same old slop." We didn't totally change the worldwide menu for what we termed "chow halls," but we did add 300 heart-healthy items to the list of choices. Now, roughly fifteen years later, the Army recruit diet is changing with milk vs. sodas, more green vegetables and lots less fried foods. It's about time, was my first thought. My second was, we've got to start earlier than the 18 to 24 year-old group. It's time to set an example for your kids and grandkids and to pay attention to what they get to eat when they're first starting out. I suspect too many parents are letting very young children make bad choices in their diets and not setting limits on their sedentary activities. We need to steer our next generations for healthy eating habits and more physical activity. Kids don't always listen to what you say, but they will notice what you do. We've purchased a number of Harvard Medical School's short publications; as expected they're excellent. I just was re-reading on on "living to 100." Most of the concepts, e.g., don't smoke, exercise regularly and eat a healthy diet, are well known to almost all of us but less commonly followed than I'd like to see. Some of the others, like take care of your teeth, establish a social network that lasts and kept your brain working hard, are also fairly obvious, but less well-publicized. But then there was an idea that I really liked: keep an optimistic viewpoint on life. I tend to be cheerful, like puns (that's a "two-fer," optimism and brain play) and view the cup as mostly full, rather than partially empty. My wife isn't hiking this summer as one knee has been bothering her; she goes to the gym for Pilates and/or yoga two or three times a week and is still in her "Strong Women, Strong Bones" class twice a week. She has a group of friends who attend one class and sit and converse afterwards; she has a close friend in the Strong,Stong class and has a snack with her afterwards. I've noticed her social network and thought I needed one myself. So this past weekend I went for a hike in the mountains with a close friend of ours. I'm ten weeks out from back surgery and have been walking, but not going to the gym. In the week before the hike I walked further, three and a half hours without pause one day (actually I stopped to pet a dog for a moment) and two hours up and down hills another day. My legs weren't as strong as usual going up the mountain to 11,440 feet and I had to stop twice, but made it to the summit. Then, on the way down, something extraordinary happened. We had seen a couple hiking up and later heard the man had stopped with Acute Mountain Sickness. Someone called 911 when they got to a point where they had cellphone reception and ten of us gathered around the couple and, in one way or another, contributed to getting the man down the slope. The National Park medics arrived with oxygen and another group brought a stretcher with a single huge wheel. When my friend and I got to the trail-head I thought, "What a great day; exercise, a superb group effort and lots of positive approaches to solving a problem." Then to top thing off, our friend came back with me, and joined my wife and I in celebrating our anniversary. With days like that I may live to 100. I just finished reading a study which came out in the American College of Physicians journal, the "Annals of Internal Medicine." I must say I'm a bit underwhelmed. A little over 300 obese subjects without diabetes or high blood pressure were followed for two years at three academic institutions. bout half were put on a diet similar to the Adkins diet, starting out with eating a small amount of low-glycemic index vegetables (I'd include spinach, broccoli, radishes and asparagus in this group, and not corn, squash, potatoes or yams), in other words foods your body can't rapidly convert to sugars. Later they got more veggies and some fruit and finally added whole grains and dairy products. The other group got a calorie restricted diet and limited their fat intake. Both groups received behavioral therapy in groups. A multitude of measurements were made at intervals (lipids, weight, blood pressure). At the six month mark, the low-carb group had more adverse, but relatively minor symptoms (bad breath, constipation, dry mouth, hair loss). At the one year mark the average weight loss in both groups was the same (11%); ditto at two years (7%). The low-carb group had increased HDLs averaging a 23% increase after two years. So why am I somewhat underwhelmed? I guess I'm happy that the low-carb group raised their HDL (good lipid) numbers, but other than that there wasn't much difference between the two groups. Both regained weight in the second year, ending up roughly 15-16 pounds down from their starting weights of about 220 pounds. Yet this was in a closely followed bunch of folk with academic centers doing the study, and, for that matter, excluding obese subjects with the obesity-related diseases we worry about. So I don't think we're there yet, in terms of helping the third of our population that is obese and not being taken studied in this detailed fashion. I was frankly hoping for more. Gluten-free diets for weight-loss? Not unless you've got Celiac Disease! We know several people who are on gluten-free diets for Celiac Disease (CD), but until this morning I hadn't been aware that others regarded this as a weight-loss method. So let's go back to what gluten is and what problems it causes. Basically gluten is a protein from three grains, wheat, barley and rye. It's often found in baked goods. Many people, in fact apparently an increasing number of people, are sensitive to gluten and should avoid consuming gluten-containing products. An article in the Journal "Gastroenterology" July 2009 by a Mayo Clinic group headed by Dr. Joseph Murray found a four-fold increase in undiagnosed CD between groups tested ~1950 and current age-matched groups. But it's considerably more complicated than that. Some people are extremely sensitive to gluten. If they ingest it in any form, and gluten is ubiquitous, found in lip gloss, on envelope flaps, in soy sauce and ketchup, they develop an autoimmune reaction and are said to have Celiac Disease. Three million Americans are felt to have this entity which can lead to a multitude of very serious complications. But, like those of us who say we're lactose sensitive, there are at least three varieties of what people think of as gluten sensitivity. Perhaps twenty million in the US are felt to have milder gluten issues without full-blown Celiac Disease; not a lot is known about this group. In a similar fashion, I'm lactose intolerant, but, I can drink a small amount of milk without developing major problems. Then there's a smaller number who are actually allergic to something in wheat and can develop severe symptoms, including asthma or shock, after eating wheat products. Again, I know individuals who, after drinking milk, end up with severe problems; they're actually allergic to another milk protein. So recently there's been a host of gluten-free products developed; those are very helpful and appropriate for people with CD, but others have seized upon the concept of using these foods as a weight-loss tool. The short answer is Don't! Many of the new gluten-free food products are high in carbs, fat and calories and relatively low in fiber, iron and vitamins. There's an excellent review of CD in "Scientific American, July 27,2009, that I was able to print out from an online source. The author is Dr. Alessio Fasano who heads the University of Maryland Center for Celiac Research. His group has found a substance called zonulin that increases gut permeability and is working with tests for an antibody that may be a biomarker for gluten sensitivity. So the gluten-free diet may not be the only answer for patients with CD and researchers are working hard to find other treatments. In the meantime, for the rest of us, that diet is clearly not the way to lose weight. I read an article in "The Wall Street Journal" recently (WSJ July 13, 2001) that gave me clues for my own eating "Hot Spots," those times when I tend to go on eating autopilot, switching from being a fairly lean, healthy eater to my late 1960s pattern of consuming anything in sight. As usual, I also looked for source material, and found an article in "Applied Psychology" that was published two years ago and another in the June 21010 issue of the "American Journal of Clinical Nutrition." Swiss researchers used the "Power of Food Scale" to measure three groups' vulnerability to so-called hedonic/hedonistic eating. Obese patients tended to react much more to the sight, smell and, in other studies, even the names of "attractive" foods. Several recent studies have shown brain activity in the amygdala, a primitive area of our brains thought to be connected to emotion, to differ in lean vs. obese subject, in response to the smell and taste of milkshakes. Scientists are exploring, via functional MRIs and measurements of hormone levels, how and when we decide to quit eating. So what does that mean for you and me? Many of us tend to eat on impulse, reacting to sight, smell, sound, and taste of foods we really like. People who are obese seem to have less/little control over this reaction. Successful dieters have the ability to pause, to have second thoughts before launching into an eating frenzy. When I look back at how I once ate, it's clear to me that I was, at times, a hedonistic eater. Now I'm almost always a homeostatic eater, eating to satisfy hunger, rather than eating impulsively. Yet there are still times when I can switch patterns. That's when I need to adopt the "one bite only" method, eat prior to parties, try my own method of cutting off a portion of each food item, avoid even the sight of high-calorie foods or just pause for a moment. We ate a wonderful Australian dinner with our small gourmet group last night. There were lots of unusual food items, some of which were potentially high in calories. I ate very well, but only gained two tenths of a pound. This morning I walked for three and a half hours, doing some hill work in preparation for a mountain hike this coming weekend. Today is a mostly vegetable day. I think I understand the hedonistic eating pattern better and, in doing so, find myself much better able to withstand tempting foods. Think about your own eating patterns, especially those times when you tend to overeat without thinking. How can you avoid or minimize this happening?. How can you spend as much of your life as possible as homeostatic eater? I had heard of the "Slow Food" movement, begun in the late 60s after McDonald's got to Rome. I didn't know much about it until I read Michael Pollan's June 10, 2010 online article in "The New York Review of Books." His six-page piece is exceptionally well worth reading; I just got back to it via Google without any difficulty. Now I'll attempt to articulate some of its points and add a few of my own views. Pollan covers some far-flung aspects of the recent history and current trends of "food in America" (and elsewhere). Early on he mentions that our citizens now spend less of their money and time preparing and cleaning up from meals than any other group in history. There has, however, been a secondary, but crucial cost, the decline of meals eaten together as a family. The impact of this is visible: our kids are growing up with meals eaten in front of the TV with an absence of family conversations; our food industry has had an enormous sway in what we eat and where, e.g., "Fast Food;" our diet with all its emphasis on ease and speed of preparation has led to the epidemic of obesity and its related diseases. Pollan notes the variegated segments of the food movement, distinct as they have been over the past thirty years or so, have now appeared to have a common focus on high-level problems: we cannot sustain our present food/farming patterns longterm without major environmental and economic consequences. Climate change issues are at the heart of this shift, as is the realization that cheap fossil fuel enabled the huge post WW II increases in farm/food system productivity via the pesticides and fertilizers they spawned. In order to solve our global warming and water issues, we will almost certainly have to alter our farming/food patterns. Our current diet, centered for many on meat-eating, consumes huge amounts of our increasingly valuable water supply. Our habits of wanting produce grown around the globe to be available on our tables year-round consumes fuel in enormous quantities. The new health care reform legislation, Pollan feels, may lead to health insurance firms having a keen interest in the prevention of chronic diseases. We appear to be at a cusp where food-related businesses, locovores, food movement organizations, health insurers and even our government may agree on the need for change. I'm tentatively hopeful that the next twenty years will see progressive shifts in our dietary patterns, our food sources, our use of fossil fuels and the longterm health of our kids and grandkids. Maybe that's asking for a lot, but the alternative is truly frightening. It's time and past time for a whole series of interlocking changes. A health-conscious blogger friend from Australia, Liana Werner-Gray, was gracious enough to feature this post recently on her own blog, The Earth Diet. Liana's blog was suggested to me by my local friend, Pat Stoltey, an author of two wonderful mystery novels. I read an article in "The Wall Street Journal" on August 6th that was a long ways away from my usual areas of interest. But in this case, it caught my attention enough to track back to an article published in "The Lancet" the day befores week and another one an Epidemiology journal from nine years ago.The synopsis of the two articles is that women who gain large amounts of weight during pregnancy have large babies. No surprise there. But large babies often end up as large teenagers. Why did I do that legwork? Well I'm really concerned about our upcoming generation's weight. Lots of youngsters are overweight; too many are obese and heading for trouble, medical-problem-type trouble, down the line. We can blame TV, lack of exercise, fast foods, fat and sugar-laden processed foods, families that let kids decide what they'll eat from early on...all the usual suspects. But here was an idea I hadn't paid much attention to, do some kids start life with an obesity strike or two against them. My caveat is this really isn't my turf; I'm an Internal Medicine subspecialist. I've delivered fifty babies, but that's old history. Nonetheless, I wanted to see the data and decide if it stood the test of time. The 2001 piece was a Finnish study that looked at nearly 4,400 sixteen-year-old twins and tracked their progress from birth. Not surprisingly, adolescents who were tall at birth and had tall parents, were often tall at age sixteen. The group I focused on were those who were of normal birth length, but high birth weight. That group was much more likely to be overweight at age 16. That fits with a number of other studies that didn't focus on twins. So there's been some good data indicating high birth weight increases chances of high adolescent weight; the same is true for high adolescent weight foreshadowing high adult weight. Now how much is nature and how much is nurture isn't clear to me. What makes sense if to re-emphasize to young women that gaining average amounts of weight during pregnancy is important. Too much gained increases the chance of heavy babies, heavy teenagers and, eventually heavy adults. Our youngsters have enough factors that can contribute to their becoming obese adults; why add one more? If you're a young person planning to have a baby, discuss this one with your own doctor. The life you improve may be your child's. This has been our first closeup and personal experience with a CSA (community supported agriculture) organization. Every Monday we drive about a mile and a half to one of the 20+ delivery sites for Grant Family farms and pick up our Couples Veggie Share and a Single Fruit Share. This was week eight and thus far we've been extremely pleased at the quality and variety of produce we've been receiving. Our only issue was what to do with it all; we've gotten six to eight different veggies a week. We have friends who split their Couples Veggie Share with neighbors, and we've given our next-door couple a few things. And when we travel we've either donated to the Larimer County Food Bank or, as will happen over the next ten days, while we're up in the mountains at the Y camp with our grandson and then flying him back to his folks in the DC area, a friend will make two pickups for us. She'll keep one for her family and split the second with us when we return. The real discovery was the recipes. Our CSA sends out a newsletter each week and it took me a week or two to catch on to the sidebars. There are fascinating thins to do with the kale, beets, romaine lettuce, and cabbage we're getting at this time in the veggie season. Then there were the English peas. The first time we got a large batch of them we just shelled them and added the pods to our kitchen compost bucket. They eventually were transferred to our vermiculture compost bin in a sheltered location just outside our garage. The following week I spotted a recipe for pea pod soup. I gathered up the ingredients: olive oil, an onion, two cloves of garlic, chicken stock, fresh thyme, zest of one lemon and the pea pods and followed the instructions. I thought the resulting soup was delicious, if a little bland; Lynnette really wanted considerably more kick to it. Having been local parents to two graduate students from India, we've been introduced to garam masala, a wonderful spice mix. We had a second day's worth of soup left over and heated that up for lunch, adding a couple of tablespoonfuls of garam masala and a teaspoon of minced garlic. Both of us tried the new recipe and agreed we had made an enormous improvement. I plan to send our suggested alterations back to the CSA. Some may like the "souped up" soup; some may not. We'll probably never make it any other way. I read an article recently in the "Wall Street Journal" about the CDC releasing the latest obesity statistics. Two hours later, as is my norm, I went to the original documents and found, on the CDC website, the press release and some thoughts from VADM Regina Benjamin, the new Public Health Service Surgeon General. Ten years ago, 28 of our states had adult obesity rates under 20% (the real goal is under 15% by the way). Now (as of the 2009 survey), looking at the national map on the CDC website, only Colorado (at 18.6%) and Washington, DC, fit into the less than 20% category. Ten years ago no state had an obesity rate over 30%; now nine do. Their location interests me; they're all clustered together and basically in the south east. Those states are Alabama, Arkansas, Kentucky, Louisiana, Mississippi, Missouri Oklahoma, Tennessee and West Virginia. The worst of the lot is Mississippi, where 34.4% of adults are obese. The national overall average is 26.7% of adults over 20 years old being obese. That translates into nearly another two and a half million Americans ballooning up into the obese category since the last survey done only two years ago. There are lots of mildly overweight people who exercise and are metabolically felt to be healthy. But when I watch television news ans see photos of groups, the really obese stand out and I don't think they're healthy at all. VADM Benjamin's statements are right on target. She notes that 70% of American Indians and Alaskan Natives are overweight or obese, non-Hispanic black adults have a 36.8% obesity rate (women in this category have a 41.9% rate), that an obese teenager has a 70% greater risk of becoming an obese adult, that non-Hispanic black teens have a higher obesity rate (29%) than Hispanic teens (17.5%) or non-Hispanic white teens ((14.5%) and that we, as a nation, have to do something about this gloomy picture. Her proposed program is worth reading and can be found by searching for her by name; she feels all components of our society need to attack this horrendous issue in order for us to be successful: our communities, individuals, child care sites, schools, work places and our medical practitioners. You might think it's routine for doctors and others in the medical community to evaluate patients for weight issues and spend time talking with them about diet and exercise solutions. But surveys show it's not. That really needs to change. But so does our own food selection and our food-related industries practices of adding sugars, salt and fats to so many processed foods and, not least, our government's indirect support for less-healthy food choices. A subsidy or tax break directed at locally owned organic fruits and vegetables may seem a radical idea, but I think it would help many of our overweight and obese citizens by making healthy food choices cheaper. For some years now, as we've gotten older and my wife's bone density studies moved into the borderline arena (osteopenia but not frank osteoporosis), we've been taking calcium tablets. We settled on a mix of calcium citrate (supposedly better absorbed than calcium carbonate) and Vitamin D. I took two of the caplets in the morning and two in the evening, giving me 1,260 mg of calcium and 1000 IU of Vitamin D. She took two in the morning and three in the evening. This week we stopped taking that supplement and I bought some dried figs instead. What's going on here? Well, the British Medical Journal (29 July 2010) published a very well-done meta-analysis (a review of a number of medical research studies) of 12,000 patients over the age of forty who were given calcium supplements in randomized, placebo-controlled research studies. The study's goal was to look at the risk of heart attacks in patients given at least 500 mg of calcium per day. The article concluded there was an increased incidence of heart attacks, about 30% more than in the control subjects and therefore the management of osteoporosis through by the use of non-food calcium should be re-evaluated. There are a number of caveats here. The supplements used didn't contain Vitamin D, which in the accompanying editorial, is said to possibly reduce fall risk and even help cardiovascular function. And the mechanism for the increase in heart attacks in unclear, so the finding may even prove to be "incidental." Today I read my copy of the ACP Internist, a publication from the American College of Physicians (I'm a Fellow of the ACP, an association of academically inclined Internal Medicine doctors). They reviewed the BMJ article, noted that its results didn't extend to supplements that include Vitamin D. They also mentioned that the editorial noted that positive effects of taking calcium supplements, a supposed health benefit for those having osteoporosis or at risk for developing it, aren't proven anyway, so why take the risk. I crossed of my Ca++s from the mini-calendar I keep to record meds taken and events upcoming. We'll wait for this controversy to resolve, if it does. In the meantime I noted that figs were the top non-dairy source of calcium in a list compiled by a physician posting on a CBS News website (the others were sardines with bones, soybeans, salmon with bones and sesame seeds). Four figs contain 506 mg of calcium (but about 130 calories). The figs were relatively expensive, but hospital stays for heart attacks are certainly more so, in a number of ways. I may get some sardines when I go buy a lemon and thyme to make pea pod soup later today. I normally drink soy milk, but had an eight ounce glass of non-fat regular milk this morning. Some studies I've been reviewing would have us not consuming any dairy either, but for now I'll continue having small amounts of non-fat milk, along with our usual generous helpings of fruits and vegetables..